Soundstreams is excited to announce that Canadian composer Andrew Staniland is our 2017 TD SoundMakers Composer in Residence! During his time in this role, he will be working with students from across Toronto as a Composer in the Classroom – teaching them to use audio samples to create their own pieces. 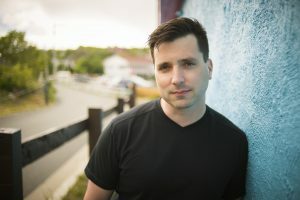 Andrew has been teaching composition in a variety of capacities for almost 15 years, including his current faculty position a Memorial University. Outside the classroom, his work has been performed and broadcast in over 35 countries and praised as “alternately beautiful and terrifying” by the New Yorker. He is the recipient of top prizes in the SOCAN young composers competition and the 2004 Karen Keiser Prize in Canadian Music, along with previously serving as an affiliate composer to the Toronto Symphony Orchestra and the National Arts Centre Orchestra. Andrew also performs as a guitarist and works with new media, computers and electronics. During his time as TD SoundMakers Composer in Residence, Andrew will be posting monthly about his experiences in the classroom and as a composer. For this first post we caught up with Andrew to discuss his new role at Soundstreams, sampling current music, and his own work. Soundstreams: What drew you to composing music? I was fascinated by music from an early age, first through guitar. My family kept an old nylon string guitar around the house that I loved to play around on. Through guitar I became interested in writing original music for myself and various heavy metal and rock bands in my teens. I was introduced to jazz and classical by an amazing teacher high school (David Smith, Victoria School for the Arts, Edmonton), and the rest is history! SS: Tell us what it means to you to be the SoundMakers Composer in Residence, and what can we expect from you over the coming months? Education outreach is a passion for me. I have been involved as a composer-in-the-classroom for almost 15 years in different capacities, first with the Alliance for Contemporary Music Projects/Contemporary Showcase, and then for several years with the Gryphon Trio’s Listen Up! program. I am very excited to develop this new program with Soundstreams on the Soundmakers platform. I have developed a new program that will introduce students to composition through sampling and improvisation, performed on their own laptops and computers. The Soundmakers platform, under development with Soundstreams, is a unique and valuable resource: essentially it is a sample bank comprised of music by some of the best Canadian contemporary composers writing today. This program will give a new life to this interesting and unique artistic resource, empowering creativity in young students while at the same time exposing them to the vast richness of Canadian music. SS: Tell us about Soundplant, the software that you will be using for the Composer in the Classroom program. As a platform for this project, I have chosen to use a free software called Soundplant. It is very capable and easy to use platform for sample playback. Students can use their QWERTY keyboard to play audio samples, essentially turning their computer keyboards into electronic music instruments. It is an exciting new direction to take for me in the classroom, having previously relied on either traditional pencil and paper composing, or using an audio editor such as Audacity. Sampling is a major part of music production today across genres, and is accessible to students who may not read music, or play a traditional instrument. Electronic music, in the form of mixed media (combining acoustic instruments with electronic sounds and processing) is a major part of my own artistic practice. SS: How do you approach writing a new piece? What do you hope people will feel? Each piece is a new experience, and I try to approach it as though it is brand new process. I like to seek out similar pieces written by other master composers. For example, if I am commissioned to write a string quartet, I will spend weeks listening to other string quartets, old, new, familiar and unfamiliar. I usually daydream quite a bit before making any decisions or even writing anything down, and I never begin until I feel I am ready. Sometimes I plan extensively, spending days or even weeks preparing harmonies, motifs, developing gestures, and so on. Sometimes I just start writing with no formal preparation. With a plan, sometimes I follow it closely, other times the plan is abandoned immediately. It is all about finding the musical fire and following it. It is an elusive thing, but ultimately, a composer must find and pursue this creative fire. I think that if an artist feels fire, passion, and excitement about their craft, that energy will be palpable to the performers and listeners as well. As a composer and as a listener, I hope to feel something – to be moved. I want to feel that gorgeous creative fire, and I want others to feel it too. SS: Do you have a favourite piece that you’ve created, and why? I have a few favourites My work Four Angels for the Toronto Symphony is very close to my heart – I think it is certainly one of the best crafted pieces I have written. You can hear it here. Composer photo by Greg Locke.